I spent the good part of Sunday afternoon enjoying the sunny weather at Frog Lake. There was a slight breeze and not a cloud in the sky, so the temperatures were in the high 60's and low 70's. There was only a few people at the lake, enjoying fishing off the banks and checking out the tadpoles in the water. 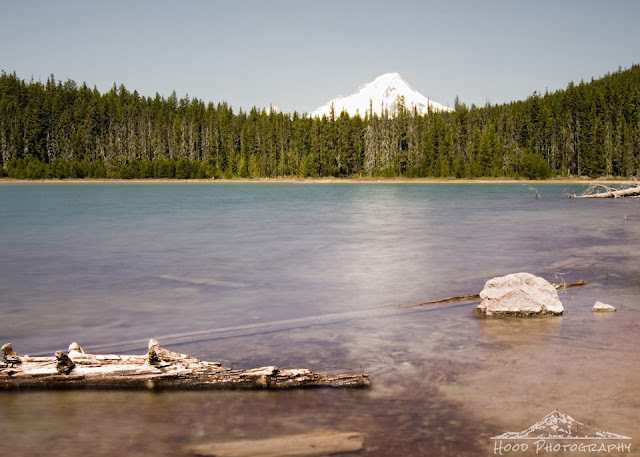 I ventured from my favorite spot on the south east side of the lake up to this point on the north side to capture Mt Hood peeking over the trees. Because of the breeze, I slowed down my shutter speed to show the clearness of the water, despite the choppy surface. A perfect way to spend the end of a weekend! Great view of the mountain, and beautifully composed! That's a beautiful photo. What a nice place to spend your day.